The song Die Forelle, D 550, which supplies the main theme for movement four of the Forellenquintett is probably the most well known of Schubert's songs, with a delightful, playful principal theme. For purely language reasons Schubert's Lieder are not quite as popular in the English-speaking world as Schubert's instrumental works. 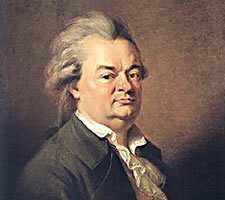 Lieder are in general a problematic area for English listeners: one must only recall the joke played on Herr Professor Schlossenn Boschen and his bewildered audience during his performance of a dreary Lied in Jerome K. Jerome's novel Three Men in a Boat [chap VIII]. Nevertheless, the melody of Die Forelle and its springing piano accompaniment have overcome all resistance to make the song popular. It certainly became popular among Schubert's circle almost immediately after it was written. Depressingly, the fate of Die Forelle, despite its almost instantaneous popularity, was much the same as that of the Forellenquintett. We don't know exactly when it was written, probably at the end of 1816 or early 1817, Schubert being then 19 or 20 years old. We possess five manuscripts with slight differences, some of which seem to be Schubert making a copy for someone from memory. 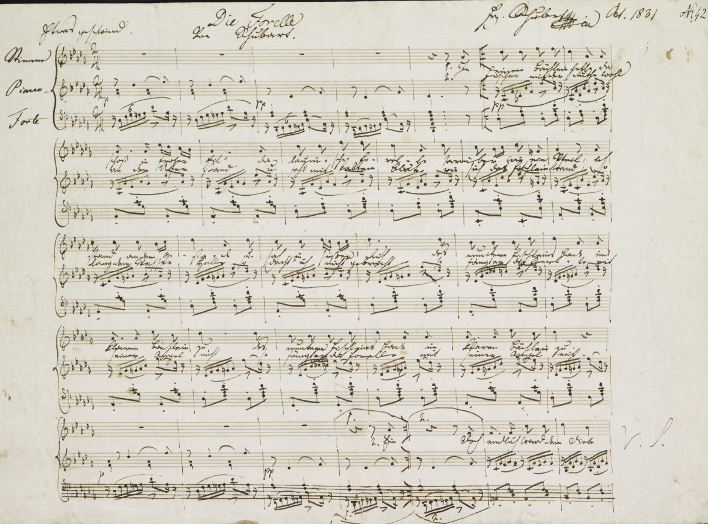 Schubert rarely revisited his works and we cannot speak of revisions or improvements in these manuscripts. We would have six manuscripts if the famous 'ink blot' manuscript – which fortunately we have in facsimile – had not been 'lost' at the end of the 19th century. The fourth manuscript managed to make it into print in a supplement to the 'Wiener Zeitschrift für Kunst, Literatur, Theater und Mode', No. 148, 9 December 1820 – a testament to the popularity of the piece, but also its death sentence in a newspaper supplement that could barely be expected to survive until the next issue. Once again, just as with the Forellenquintett, the work would not be published properly until its creator was safely dead. The poem which Schubert used as his text was written by Christian Friedrich Daniel Schubart (1739-1791) – Yes, it's Schubart, the German writer and musician, not Schubert, the Austrian composer. Schubart is little known and whatever mention there is of him, particularly in the English-speaking world, is often unreliable. The reader of this post sighs, now aware of what is coming: yes, we need to go into some detail about this irridescent character. Worse: in order to understand Schubart's poem Die Forelle we have to dive into waters that are deep and anything but clear – in fact, very murky waters indeed. ^ Hans Gál (1890-1987), Franz Schubert oder die Melodie, Fischer, 1970, p. 133. Wer bereit ist, zu tadeln, möge einen mildernden Umstand in Betract ziehen: das ist Musik, die man nicht um die Welt missen möchte, Musik, deren Zauber über all Formbedenken hinweg jeden Widerspruch gegenstandslos macht. ^ Otto Erich Deutsch, Schubert: Die Dokumente seines Lebens, Breitkopf und Härtel, Leipzig, 1980, p. 82. [13. Juli 1819] Ich befinde mich bis jetzt recht wohl, nur will das Wetter nicht günstig sein. Es war hier gestern den 12. ein sehr starkes Gewitter, welches in Steyr einschlug, ein Mädchen tödtete und zwei Männer am Arme lähmte. In dem Hause, wo ich wohne, befinden sich 8 Mädchen, beynahe alle hübsch. Du siehst, dass man zu thun hat. Die Tochter des Herrn v. K(oller), bei dem ich und Vogl täglich speisen, ist sehr hübsch, spielt brav Klavier, und wird verschiedene meiner Lieder singen.